PT Waskita Beton Precast Tbk - Waskita Precast (IDX : WSBP) is a rapid growing public-listed precast concrete producer in Indonesia. Waskita Precast is a producers of high quality precast concrete products. Its products include precast building and bridge, precast retaining wall, precast drainage, precast ready mix and other precast products. Waskita Precast is a directly-owned subsidiary company of state-owned construction firm PT Waskita Karya (Persero) Tbk (Waskita Group). At present,Waskita Precast is 59.99% owned by PT Waskita Karya (Persero) Tbk, 0.01% by Waskita Cooperative and 40% by general public. 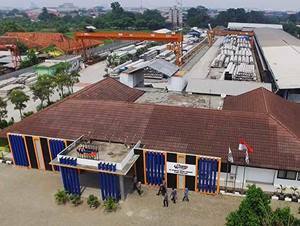 Headquartered in Jakarta, Waskita Precast has installed total production capacity 2.65 million tons through its 10 precast plants spread across Indonesia. According to PT Waskita Beton Precast Tbk Annual Report 2016 as quoted by JobsCDC.com, Waskita Precast succeeded in posting excellent financial performance in the full year of 2016 (ended in 31 December 2016). Waskita Precast registered total assets of Rp 13,73 trillion in 2016. This figures reflected an 217.01% increase from Rp 4.33 trllion in the previous year (2015). Total revenue in 2016 amounted to Rp 4.72 trillion or 78.39% growth from Rp 2.64 trillion in 2015. Male (maximum age of 35 years old). Possess operator license (SIO) Loader. Minimum 1 year of experience in the project work. Willing to work shift and overtime. Male (maximum age of 28 years old). Minimum SMK Electrical Engineering, Mechanical Engineering. Able to operate batching plant machine. Male (maximum age of 27 years old). Minimum SMK building or D3 Civil Engineering. Male (maximum age of 24 years old for Fresh graduate and 28 years old for experienced). Male (maximum age of 24 years old for Fresh graduate). Able to create a Budget Plan (RAB). Strong understanding of shop drawing. Possess operator license (SIO) is preferred. Female (maximum age of 25 years old. Strong understanding of financial report. JobsCDC.com now available on android device. Download now on Google Play here. Please be aware of recruitment fraud. The entire stage of this selection process is free of charge. PT Waskita Beton Precast Tbk - SMA, SMK, D3, S1 Operator, Staff Waskita Group April 2017 will never ask for fees or upfront payments for any purposes during the recruitment process such as transportation and accommodation.